This week I started a sourdough starter. So far it’s doing pretty well. I really want to figure out making sourdough products. Knowing how to use sourdough helped Ma feed her family through “The Long Winter” when she did not have yeast available. I also asked my children to write how their ideal day would be scheduled. Then I took all of their schedules and made a master schedule for all of us. I think I did pretty well at giving everyone pretty much what they wanted. We’ll see how this schedule works this school year. This article really spoke to me. I know I could do more to be more self-disciplined and get more done every day. I know there are times that I waste time. That’s one reason why I made a schedule up for us. I just always feel better when I’m moving steadily through my day accomplishing my to do list instead of looking back on a day with only one or two items crossed out. More than one person in our family has suffered from eczema at one time or another. Shortly after my second baby I started a battle with eczema that lasted months. It would clear up and come back. It was so frustrating. Anyway, I tried a lot of different things. Different approaches worked for different people in our family. Eczema is certainly not something that can be fixed just one way like some sicknesses. Anyway, this article has a soak for baths that couldn’t hurt if you’re suffering from eczema and may even help. My seven-year-old does so much better in school when I let him get physically active at regular intervals. Now we’re going to be able to have some variety in his activity which will make it more fun. I know mom’s enjoy the first day of school – routine, sweet routine – but the children usually not so much. How about making it special with an idea from this post? 25 FUN First Day of School Traditions! And one final post about school. I love the idea here for making a flip chart for defining and giving examples of parts of speech. I definitely want to have some of my children make these this year. I think it would really help them. This picture is too funny and is how I feel sometimes when I’m working and I have little eyes watching my every move. How soon are your children starting back to school? 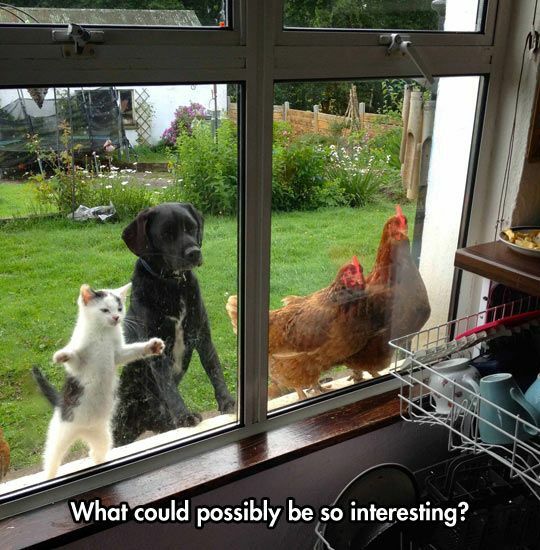 The pic says, “The grass is greener on the inside” hahaha – those animals are cute. I like the flip chart – that is a great idea for parts of speech. I’ll be honest – I tend to just want to jump right into school and not do any “fun” stuff to start with lol. This year we will do art on Friday mornings along with our quizzes. I have the Rod & Staff art program to follow. Great ideas for the “brain breaks” although Tim has them all throughout the morning when he stops to talk to me :). Have always been grateful that our children have not suffered from skin conditions but I’m saving this just in case and have shared it with a friend 🙂 Thanks! Last year I was struggling so much with my 7-year-old because while he is infinitely capable of sitting still for an hour to read a book, when it came to spending 5 minutes doing math problems or writing spelling words… not so much. So I instituted the practice that if he did a subject *Without Whining* he got a 5-minute break. He could do 2 or 3 in a row and bank up 10 or 15 minutes if he wanted to. We’re doing that again this year, and it’s still working — he gets time to play Legos or run around outside or whatever it is that he needs to do, and then when his timer goes off, back he comes a bit refreshed. Also gives me time to prep science experiments or whatever else might be needed, or work 1-on-1 with my Kindergartener without him around to distract her. Little boys and movement – you can’t escape the fact that it’s a physical need they have. 🙂 When I let Micah run laps (our house is nicely set up for indoor laps 🙂 ) he will run until he can’t run another step. It’s amazing how much better his brain works after a hard run. Another sarcastic mama! I could hug you. Because I do that same thing fairly often — they ask me what I’m doing when it’s very obvious what I’m doing, or when I’ve repeatedly told them what I’m going to do, so I will say something completely different because… they have eyes and ears and need to use them. We have “the racetrack” in our house that serves that same purpose, and sometimes I make Sam do jumping jacks because a) they wear him out faster than running because the boy can run forever, and b) he’s super cute doing jumping jacks and it makes me giggle. I learned my sarcasm from the best – my mom. 🙂 Sometimes I think they talk just to hear themselves, and since I hear them all. the. time. I’m not interested in listening to unfiltered questions. I should try jumping jacks with Micah. He’d probably get giggly. Then I would. Laughing together is always good for lifting the spirits. That’s what I love about your own children. They can irritate you to death, and then they do something that makes you laugh in spite of your anger/frustration, and the situation is relieved. Whaddaya know? I inherited it from my mom too! Though I refined it thanks to a deeply sarcastic college roommate. My mom totally admits to her sarcasm. I have one sister who has perfected it to an art, and I do think it is an art. There is a fine line between pointing out a brainless moment and totally hurting someone’s feelings. It is indeed a fine art, being sarcastic without being mean. It saddens me that so many people (my mother-in-law included) equate all sarcasm with meanness and despise it. Oh well.